Four U.S. soldiers killed on patrol in Niger did not expect to make contact with the enemy and were caught by surprise when 40 to 50 militants ambushed their position, CBS News correspondent David Martin reports. The attack occurred on Oct. 4 when the commandos were on a joint patrol near the Mali border about 120 miles north of Niamey, Niger's capital. Four Nigerien soldiers were also killed in the attack, which U.S. officials have said was likely conducted by extremists linked to the Islamic State of Iraq and Syria (ISIS). A U.S. official tells CBS News that the patrol was considered low risk and as a result the soldiers were not protected by air cover. French fighter jets arrived about 30 minutes into the firefight, the official said. The U.S. Africa Command is investigating whether any of the soldiers could have been saved if they had been evacuated more quickly. The Defense Department identified the soldiers killed in the attack as Sgt. La David T. Johnson of Miami Gardens, Florida; Staff Sgt. Bryan Black, 35, of Puyallup, Washington; Staff Sgt. Jeremiah W. Johnson, 39, of Springboro, Ohio; and Staff Sgt. Dustin Wright, 29, of Lyons, Georgia. President Trump has turned the soldiers' deaths into a political football back home, falsely suggesting this week that previous presidents had not called the families of fallen soldiers. 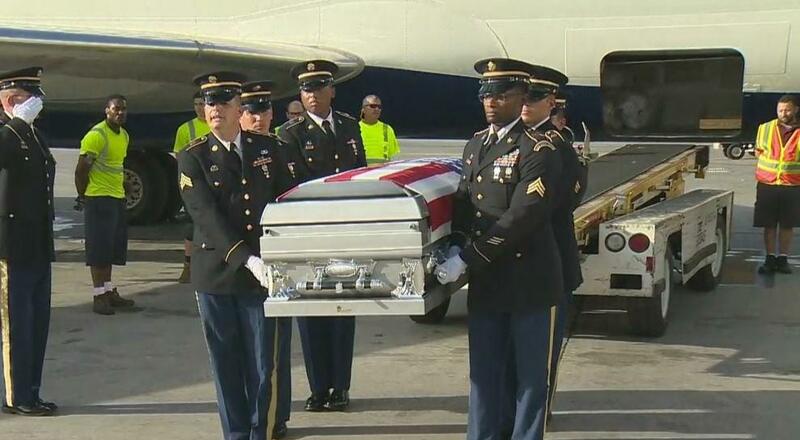 Rep. Frederica Wilson of Florida said Tuesday that Mr. Trump told Johnson's widow in a phone call that the soldier "knew what he was getting into" when signing up for the military. Mr. Trump denied Wilson's accusation Wednesday morning.